If you are a contributor to Clicklaw Wikibooks, you can manage your profile information on the Preferences page. 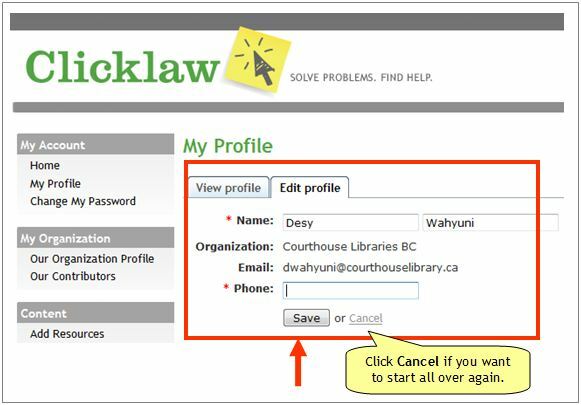 If you are a contributor to the main Clicklaw site, you can manage your profile information, which includes information about how you can be contacted. This information is only visible to you and the Clicklaw editor, so that we can contact you when necessary. Click “Update your profile” if you’re on the homepage or click “My profile” in the left menu of the contributor site. Click on the Edit profile tab. Edit your information and click the Save button.